Famore brand scissors and shears start from the finest grade of steel, which is hot forged, then inspected by cutlery artisans to meet exact quality standards. The end result is scissors of uncompromising quality and craftsmanship, that will bring you a lifetime of cutting pleasure. Here is a little peak at all of the new Famore scissors. 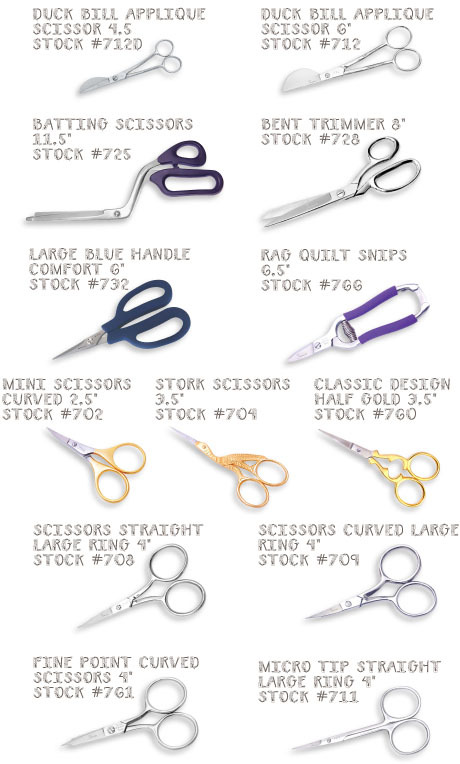 Famore Scissors can be found at your local quilt shop or ordered wholesale from United Notions. There are scissors that I`ve never used. Oooh, I like the batting scissors. I will have to put them on my wish list. I have truly fallen in love with Famore. Great quality, durability and price/value. I definitely want to try their 4″ curved scissors. Look like they’d be perfect for free-motion quilting and for machine embroidery too! This is very economical and reliable for the people I live in Pakistan and i always suffer from irregular things but now, i have got great thing to make friends online and get the online things with low cost and reliability.